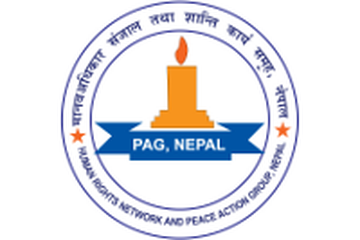 Human Rights Network and Peace Action Group (PAG) Nepal is a Nepalese human rights and peace organisation. It was established as a loose network of human rights and peace activists, journalists, indigenous groups and lawyers of the eastern region of Nepal in 2004 and has since been involved in the protection and promotion of human rights and peace in the region. Since its establishment, PAG has worked towards improving the human rights situation at the grassroots level, with a special focus on the rights of women, children, and marginalised groups. PAG has been further working to support peacebuilding processes working with conflict-affected and internally displaced people. The organisation also seeks to enhance the capacity of human rights defenders and peace activists in Nepal through organising trainings and information-sharing. The reintegration of conflict-affected children and young people has been regarded as crucial to sustainable peace in Nepal. PAG implements a reintegration programme “Reintegration of children/ youths formerly associated with armed forces & armed groups and children affected by armed conflict"program in 13 districts named Jhapa, Ilam Panchthar, Taplejung, Tehrathum, Morang, Sunsari, Dhankuta,Sangkhuwasabha, Bhojpur, Okhaldhunga, Khotang and Saptari of Eastern Nepal as lead organization of Eastern Region. The overall purpose of the program is to support overall peace process through the education, skills, health-related training, and micro-enterprises, of the children previously associated with armed force and armed groups.The reintegration program includes education, skills and employment training, and health education. The organisation is working in cooperation with the United Nations Children Fund (UNICEF). PAG has been implementing their 'Human Rights Education and Peacebuilding' programme in twenty 'Village Development Committees' in Mechi Zone. The goal of the programme is to contribute to ending the culture of impunity and establishing sustainable peace through human rights education. Constructive dispute handling processes are taught and adopted to resolve local human rights issues. Similarly, 'Human Rights Protection Committees' have been established.